We’re told the new proposals are a big step forward because, unlike Direct Payments, they would only pay out when farmers actually experience a loss. Professor Babcock’s analysis shows that in the case of the proposed Supplemental Coverage Option (SCO), nothing could be farther from the truth. If SCO is enacted, the reality is that it could send policyholders payments that are far larger than direct payments even when they have suffered no financial loss at all. 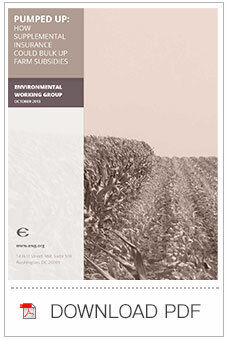 Professor’s Babcock’s calculations show that in 2012 the Supplemental Coverage Option, when combined with the seriously flawed Revenue Protection (RP) type of crop insurance policy, would have sent payments ranging between $172 and $322 per acre to corn growers in Champaign County, Ill.. These payments would have boosted farm revenue in this drought-plagued county to as much as $1,458 per acre – far higher than the $1,136 per acre that these growers would have made with no drought. SCO, it turns out, would be just another way to send cash to farm businesses regardless of need, but with better optics. And these windfall gains for farmers would have added another $6.8 billion – on top of the $17 billion in crop insurance payouts actually made in 2012, the vast majority of that funded by taxpayers. Swapping SCO for direct payments is an expensive and cynical game of bait and switch masquerading as reform. Taxpayers are more than willing to step in to cushion producers from potentially crippling losses caused by widespread natural disasters. This is as it should be. Professor Babcock shows that a simple revenue insurance policy would have put a solid floor under growers in the counties hard hit by the 2012 drought – and ensured that payouts only went to growers who actually needed the help. Professor Babcock’s analysis undercuts any possible rationale for piling SCO or any other so-called “shallow loss” protection on top of the already bloated crop insurance program. Such proposals would simply accelerate the sad transformation of crop insurance from a useful risk management tool to just another taxpayer-financed income support program. This is not the way to go. Instead, Congress should simply end direct payments and split the savings between deficit reduction and investments in conservation, healthy food, research and other priorities that would provide far greater benefits to all of agriculture – and to taxpayers. But it should not stop there. A truly reform-minded farm bill would go much farther and take on fundamental reform of the entire crop insurance program. That would be the kind of reform that farmers need and taxpayers deserve. Unfortunately the farm bills currently under debate take us in the exact opposite direction.